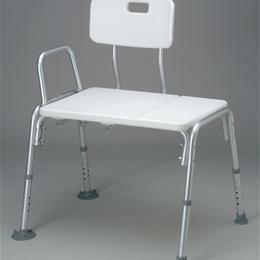 Aluminum Frame Transfer Bench: Push-Button Assembly For Arm And Back. Durable, Blow-Molded, Plastic Bench. Wide Base, And Suction-Cup Tips On Two Legs In Tub Offer Extra Stability And Safety. Direction Of Seat Back Can Be Reversed Easily Without Tools. Anodized, Aluminum Frame Adjusts In 1-1/2" Increments. For A Seat Height Of 16-1/2" To 21-1/2" Above The Floor. Fits Tubs 11" To 21-1/4" Deep. 1" Space In Seat For Shower Curtain, Composite.